The 2000 is a well established and versatile curved stair lift system with the tightest track bends available in the industry. It can accommodate a wide range of stair configurations and will hug the edge of your staircase leaving you with more room. The twin rail system provides a safe and smooth ride. It is available in two colors as standard, light grey or gun metal, but can actually be supplied in any color to match your decor. The 2000 comes with two year manufacturer’s parts warranty and Lifetime warranty on the gearbox and motor. Contact us for more information. Furthermore, all our stair lifts are tested and approved by worldwide independent inspection services. This gives you the assurance that all our products meet the highest standards in terms of quality and safety. All Handicare curved stair lifts come with two remote controls as standard, so you can have one upstairs and one downstairs. This means you can send your curved stair lift up and down the track without having to sit on it. 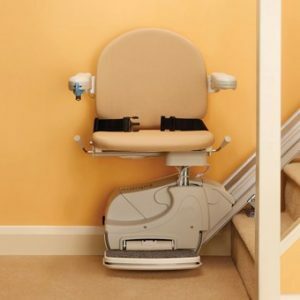 This not only allows you to park at the top or bottom of the stairs, it is ideal for multi-user situations as your curved stair lift can be called between levels, just like an elevator. Rapid response safety sensors stop the stairlift if it meets with an obstruction during travel. Once the obstruction is removed the curved stair lift can continue on its journey. Your stairlift will also come with a seat belt as standard for additional peace of mind. Also, all Handicare stairlifts have an easily accessible key switch that allows you to disable the lift and prevent unauthorized use. You do not need to worry about unsupervised children playing with your curved stair lift. How about a hinge track for your curved stair lift? You need not worry that doorways will be obscured or that tracks will cause excessive trip hazards. A hinge track is available for the 2000. The fully automatic hinge track will be raised and lowered without the user having to operate it. If you are thinking about having a stairlift you are faced with a number of choices. 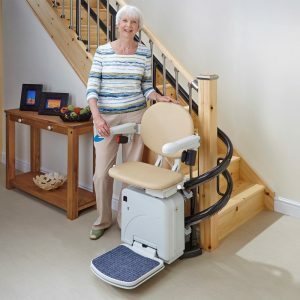 You not only need to consider the various features and options available, but also how the stairlift will look in your home. Will it compliment your décor or leave enough space for others to use the stairs? …At Handicare we have the unique Vision 3D vision app. At Handicare we understand how difficult it is to imagine what a stairlift will look like on your stairs from just looking at pictures in a brochure or on a website. We know that you want to make the best choice possible and we are delighted to be able to offer you additional help to make choosing the right stairlift a lot easier! You can now have a 3D preview of Handicare’s stairlift range in the comfort of your own home thanks to Handicare’s unique Vision app. Vision by Handicare is a special app we have developed to enable our advisors to show you what a stairlift will look like on your stairs. Thank you Towson Medical equipment company! We love our new stairlift! I would love to give you the best recommendation on the curved Stairlift. When reviewing all of our stairlift companies it became evident to us that only one company in the area that was reputable and affordable. We searched high and low for the best quality of service and support and Towson Medical was the winner every time. Not only do you provide support for all of your products, but you also have certified and insured technicians for the installation. Towson Medical also was the lowest priced company hands down. Every product that we reviewed they had the lowest price.